The parallel between a magician and a filmmaker is such a strong one, as each uses tricks and misdirection to amaze and surprise audiences, that it becomes difficult to watch any film focusing on stage magic and not perceive it as some kind of metaphor for the filmmaking process, The Prestige being the best example. In the case of Now You See Me, the image that springs to mind is the kind of magician-for-hire who you'd encounter entertaining kids at birthday parties, an amiable clown who throws some laughs at you in the hopes it will keep you from watching too closely and not think very hard about his tricks after they've been performed, lest they fall apart under scrutiny. And sometimes even when you catch them pulling off a switch or palming something, you find yourself amused enough that you might let it go unnoticed. The misdirection starts immediately with our introduction to clever but egotistical illusionist J. Daniel Atlas (Jesse Eisenberg), sleazy mentalist Merritt McKinney (Woody Harrellson), glamorous escape artist Henley Reeves (Isla Fisher) and streetwise hustler Jack Wilder (Dave Franco), who are summoned together by an unknown benefactor and provided with plans and designs for a very special magic act. A year later they're headlining in Vegas as The Four Horsemen and pull off one of the most audacious tricks the town has ever seen: in full view of their audience and never leaving the stage themselves, they rob a bank... in Paris. 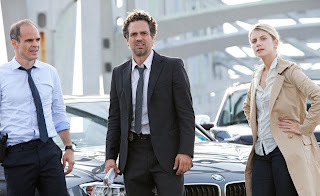 It turns out the bank robbery isn't a mere trick but has somehow actually happened, a puzzling crime that attracts the attention of the FBI and gets agent Dylan Rhodes (Mark Ruffalo) assigned to the case alongside Interpol agent Alma Dray (Mélanie Laurent). But the foursome's techniques are so impenetrable, the authorities can't prove anything and let them go, hoping to catch them in the act after they promise additional feats of larceny for their next two shows. Inserting himself into the case is former magician Thaddeus Bradley (Morgan Freeman), who's made a fortune violating the code of the profession by revealing magicians' secrets and is eager for the publicity that taking down the Horsemen will bring him. Unfortunately the film gets off to a wobbly start early as the script pulls a quick bait-and-switch. Rather than focus on the Horsemen trying to decipher the mystery of who the Mabuse-style planner behind their schemes is, the screenwriters focus on keeping the particulars of their magic show tricks a surprise from the audience. Unfortunately, since writers Ed Solomon, Boaz Yakin, and Edward Ricourt are content to dodge the challenge of preserving those surprises while developing the characters, they take the focus off the four magicians right off the bat. To be fair, having the four obey someone else's instructions wouldn't make them very proactive protagonists anyway, but as a result, the actors precious little screen-time to bring their roles to life. Harrelson does the best, quickly defining his character's lack of ethics as he uses his powers of hypnotism and deduction to blackmail tourists. Eisenberg merely cranks up the arrogance he perfected as Mark Zuckerberg in The Social Network without much chance to humanize Atlas beyond that. Franco gets to jump around in one of the film's big action set pieces while the adorable Fisher is reduced to acting as window dressing, with her character's most interesting quality being that at the start, she's the only one using her talents for honest showmanship, a trait that would have been nice to see expanded on. Another odd misstep; despite how each character's particular skills are highlighted in their introductions the way they would be in a conventional caper movie, most of these skills don't really come to play into the story. To compensate for this switcheroo, the film makes use of an interesting character archetype that we'll call the Gerard after Samuel Gerard, the dogged pursuer from The Fugitive. This figure is usually a cop or investigator who relentlessly pursues a film's protagonist but can never actually catch them, or at least not until after the hero resolves their dramatic need. Rather, the Gerard usually is left cleaning up the messes our hero or heroes leave, often getting involved in their plans or motivations and developing a grudging respect for them. Other examples include Ed Harris' D.C. cop from Absolute Power, Tom Hanks' fraud agent from Catch Me If You Can and, most appropriately here, Paul Giamatti's Inspector Uhl character from The Illusionist. And so, once the investigation begins, the narrative weight falls onto Agent Rhodes, a Gerard who gets promoted to be the film's main protagonist. The appealing result is that we get to spend most of the film alongside Ruffalo, who radiates a humility and self-effacing charm that makes it very easy for us to cheer him on as he tries to catch the same four characters that we were preparing to root for a few scenes before. Also helping him gain our sympathies is the fact that we have to watch him take so much abuse from other characters. Not since Jon Snow has a character been so often reminded of how little he knows. As his newfound partner, Laurent is stuck inhabiting a character who must remain largely ambiguous for plot reasons. Thankfully she succeeds in making the most of her scenes to develop a nice rapport and chemistry with Ruffalo, even if much of their relationship consists of awkwardly on-the-nose debates about the value of magic and illusion in society. Unfortunately Michael Caine's appearance as the tycoon who's bankrolling the magicians' stage show has the negative side effect of reminding us how much better of a movie The Prestige was. Matters aren't helped by how thin the role is. We spend much of the movie unsure of what to make of him and once his part in the Horsemen's overall plan is revealed, the movie seems unsure of what to do with him, electing to pull another magic trick by making his character disappear... in a narrative sense anyway. The casting of Morgan Freeman is more successful, subverting the charisma and wisdom of his usual screen persona by letting him play as a condescending killjoy who's eager to ruin the careers of prestidigitators for notoriety and profit. His confrontations with Rhodes, in which he effortlessly and sadistically skewers the agent's efforts to catch the team, earn him our dislike even as they open up some weird ethical questions the film dances around. We feel like we're supposed to disapprove of his greedy motives even after we've watched three of our four pseudo-protagonists use their skills for similarly ignoble purposes in the opening. More ironically, his quest to reveal the secrets of magic is painted as the ultimate betrayal of the craft, and yet if the film failed to reveal how the Horsemen pull of their schemes to us as an audience, we'd cry foul. Unfortunately, once the secrets to their tricks are revealed, we might cry foul anyway. Many of the foursome's most shocking feats are handwaved through fanciful usage of technology. While holographic projectors can make it appear that Tupac is onstage at Coachella performing years after his death, their application to pull off what's depicted onscreen is dubious at best. This problem extends behind-the-scenes as well. For a film about magic, we see very little of it performed practically, with many of the illusions carried off by computer-generated effects rather than stagecraft. Even Burt Wonderstone gave us at least one mystifying real-time illusion. I do have to acknowledge one really effective bit of cinematic magic in the opening card trick, in which the use of a subtle visual cue allows Atlas to seemingly guess the card that filmgoers would have chosen. Another cheat committed in the film is a pet peeve of mine, as once the full plot is revealed, we realize in retrospect that many characters have been acting illogically and seemingly against their own agendas for no other reason than to keep the audience in the dark about what's going on. Along with the high levels of coincidence, the ridiculous preplanning that would be required to pull of what we seen and the overcomplicated plans that characters carry out, resorting to this kind of tactic moves beyond misdirection and comes dangerously close to outright contempt for the audience. And yet the film still manages to be buoyant enough to avoid sinking under the weight of these problems. Part of that must be attributed to director Louis Leterrier, who tends to be a bit underappreciated, particularly since his Incredible Hulk reboot remains one of the most entertaining superhero movies of the past few years for me. He's adept at jumping into different styles from project to project and gives this story a shiny visual style, quick pacing and a light, breezy tone that makes you want to have fun with it. In fact, pointing out the undeniable flaws of the movie makes me feel a bit like that bratty kid in a magician's audience who yells out how a trick was done. Sometimes even when you see how you're being manipulated, you can draw a bit of fun out of it. 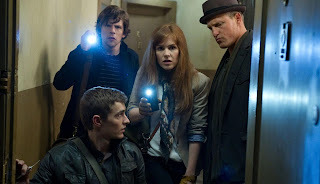 The likeability of the actors and Leterrier's bag of cinematic tricks imbue Now You See Me with just enough pleasant showmanship to be sufficiently entertaining... even if its narrative tricks are old hat.